Dendritic cells (DCs) play a key role in the activation and regulation of B and T lymphocytes. Production of indoleamine 2,3-dioxygenase (IDO) by macrophages has recently been described to result in inhibition of T cell proliferation through tryptophan degradation. Since DCs can be derived from monocytes, we sought to determine whether DCs could produce IDO which could potentially regulate T cell proliferation. Northern blot analysis of RNA from cultured monocyte-derived human DC revealed that IDO mRNA was induced upon activation with CD40 ligand and IFN-γ. IDO produced from activated DCs was functionally active and capable of metabolizing tryptophan to kynurenine. Activated T cells were also capable of inducing IDO production by DCs, which was inhibited by a neutralizing Ab against IFN-γ. DC production of IDO resulted in inhibition of T cell proliferation, which could be prevented using the IDO inhibitor 1-methyl-dl-tryptophan. These results suggest that activation of DCs induces the production of functional IDO, which causes depletion of tryptophan and subsequent inhibition of T cell proliferation. This may represent a potential mechanism for DCs to regulate the immune response. Dendritic cells (DCs)2 are potent activators of quiescent T cells (1). Besides this significant stimulatory capacity, DCs have an important regulatory role as well. Th1 and Th2 differentiation may be regulated by distinct DC subsets (2). In addition, DCs may play a pivotal role in the induction of peripheral tolerance (1). Tolerogenic DCs may derive from a specific lineage, such as the lymphoid DC. Alternatively, the same DC type may be responsible for both tolerogenic and immunostimulatory functions, depending on the level of activation and expression of costimulatory molecules, number of DCs that migrate to the lymph node, and other factors (3). Regardless of their source, the properties of DCs that determine their stimulatory, inhibitory, and regulatory roles have not yet been elucidated, and it is possible that DCs express a complex repertoire of positive and negative cytokines, transmembrane proteins, and other molecules. Indoleamine 2,3-dioxygenase (IDO) is the rate-limiting enzyme in the catabolism of tryptophan (4). IDO production by syncytiotrophoblasts (5) or macrophages (6) has recently been demonstrated to result in the inhibition of T cell proliferation due to tryptophan depletion. We hypothesized that IDO may be produced by activated DCs as a possible mechanism to regulate T cell responses. Buffy coats were obtained from normal donors or melanoma patients treated at the Clinical Center, National Institutes of Health (Bethesda, MD). No differences were observed between cells derived from normal donors and melanoma patients. PBMC were isolated using a Ficoll-Hypaque gradient (LSM; ICN Pharmaceuticals, Aurora, OH). Cells were plated in culture flasks or plates (1 × 108 cells per T-75, 3 × 107 cells per T-25, or 1 × 106 cells/well in 96-well flat-bottom plates, all from Costar, Corning, NY) using RPMI 1640 medium (Life Technologies, Gaithersburg, MD) supplemented with 10% human AB serum (Gemini Biological Products, Calabasas, CA), glutamine, and antibiotics (Life Technologies), and adherent cells were isolated after overnight culture at 37°C. Adherent monocytes were cultured in GM-CSF (100 ng/ml, which is equivalent to 1000 U/ml) and IL-4 (500 ng/ml = 1000 U/ml; both from PeproTech, Rocky Hill, NJ, and added on days 1, 3, and 5 of culture) (7, 8). For studies utilizing purified DCs, monocytes were initially isolated using negative selection instead of adherence (StemSep Columns; Stem Cell Technologies, Vancouver, Canada). On day 6 of culture, DCs were activated with soluble CD40L trimer (500 ng/ml; gift from Immunex, Seattle, WA), LPS from Salmonella typhimurium (5 μg/ml; Sigma, St. Louis, MO), IFN-γ (50 ng/ml = 1000 U/ml; Peprotech), or combinations of these agents as indicated. Colon cancer (Colo 320, HCT116, Lovo, and LS180) and breast cancer (MDA-MB-231) cell lines were obtained from American Type Culture Collection (Manassas, VA) and were cultured in RPMI 1640 containing 10% FCS. Tryptophan is catabolized by IDO to N-formylkynurenine which is rapidly converted to kynurenine. Measurement of kynurenine levels can provide evidence of functional IDO activity. Because kynurenine can be further metabolized to downstream products, it is not entirely quantitative, but can provide a relative indication of IDO activity. Approximately 24 h after activation, DCs were washed and resuspended in HBSS containing 100 μM tryptophan (Life Technologies). Cells were incubated for an additional 4 h, followed by harvest of supernatant and quantitation of kynurenine by HPLC. HPLC was performed according to Young and Lau (10) with minor modifications. Briefly, 25 μl of the clarified sample was injected into a Vydac C18 monomeric column and eluted with KH2PO4 buffer (0.01 M KH2PO4 and 0.15 mM EDTA, pH 5.0) containing 10% methanol at a flow rate of 1.0 ml/min. The spectrophotometer was set at 254 nm to detect both kynurenine and tryptophan. The retention time was previously determined with standard solutions of kynurenine and tryptophan. IDO activity was expressed as the concentration in micromolars of kynurenine in the sample, converted from tryptophan by IDO. Autologous T cells were isolated by negative selection using immunoaffinity columns containing Abs against B cells, NK cells, and monocytes (R&D Systems, Minneapolis, MN). DCs were cultured and activated in 96-well plates as described above. Twenty-four hours after DC activation, medium was replaced, and OKT3 (anti-CD3; Ortho-Biotech, Raritan, NJ) and autologous T cells (2 × 105 cells/well) were added in the presence and absence of a variety of concentrations of 1-methyl-dl-tryptophan (1-MT; 250 μg/ml, 500 μg/ml, and 1000 μg/ml; Aldrich Chemical, Milwaukee, WI). Four to 5 days later, T cell proliferation was measured using overnight incubation with [3H]thymidine (1 μCi/well; NEN/DuPont, Boston, MA). On day 6 of DC cultures, purified T cells (1 × 107 T cells per T-75) were added in the presence of 100 ng/ml OKT3. To determine the role of IFN-γ, 500 ng/ml of a neutralizing Ab against IFN-γ (from clone 25718.111; R&D Systems) or an equivalent concentration of an isotype control was added. T cells were removed 48 h later using anti-CD2-coated magnetic beads (dynabeads; Dynal, Oslo, Norway). DCs were then replated at a concentration of 1 × 105 cells/well in a 96-well plate or 1 × 106 cells/well in a 24-well plate in HBSS containing 100 μM tryptophan. Cells were cultured at 37°C for an additional 8 h, and supernatants were then harvested for the kynurenine assay as described above. Cultured monocyte-derived DCs from normal donors or melanoma patients were activated with CD40L, LPS, IFN-γ, or combinations of these, and total RNA was prepared 6 and 24 h after activation. Using a human IDO cDNA probe, Northern blot analysis revealed a strongly hybridizing 2.0-kb band from DCs activated with a combination of CD40L, LPS, and IFN-γ. This was seen by 6 h after activation (Fig. 1⇓) and was strongly positive in all six DC cultures tested with this combination (derived from three normal donors and three melanoma patients). IFN-γ alone and the combination of CD40L and LPS induced IDO mRNA in six of six and seven of eight DC cultures, respectively, but the hybridization intensity was variable and only weakly positive for some cultures. CD40L or LPS alone did not consistently induce IDO mRNA. No differences were seen between DCs derived from normal donors or those derived from melanoma patients. 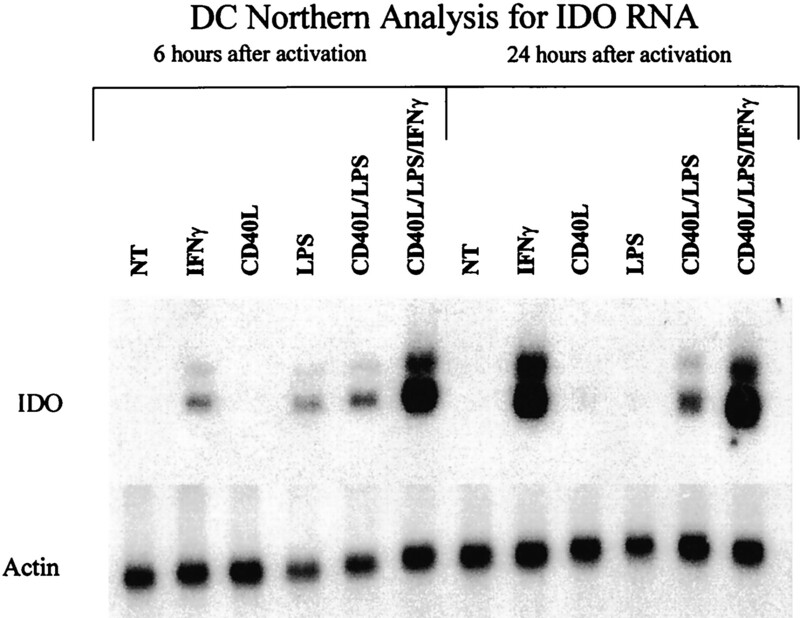 Northern blot analysis of RNA from activated DCs for IDO mRNA. Monocyte-derived DCs were grown by culturing adherent PBMC in GM-CSF and IL-4. On day 6 of culture, DCs were activated with IFN-γ, CD40L, LPS, or combinations of these. Six and 24 h later, total RNA was isolated and Northern blot analysis was performed using an IDO cDNA probe. β-Actin cDNA was used to control RNA loading. The highest level of IDO mRNA was seen from DCs activated with a combination of CD40L, LPS, and IFN-γ. Data shown are representative of analyses performed on DCs derived from three normal donors and three melanoma patients. To determine whether the induction of IDO mRNA resulted in the production of functionally active IDO, the HPLC assay for the tryptophan breakdown product, kynurenine, was performed. Twenty-four hours after DC activation by CD40L, LPS, IFN-γ, or combinations of these agents, cells were washed and resuspended in HBSS containing 100 μM tryptophan and incubated at 37°C. Four hours later, supernatants were harvested and kynurenine was measured by HPLC as described above. Kynurenine was not detected in supernatants of nonactivated DCs or DCs activated with soluble CD40L trimer alone. However, kynurenine was detected in two of five cultures activated with LPS alone (mean, 6.4 μM), and levels increased in supernatants from DCs activated with a combination of CD40L and LPS (mean, 13.6 μM). IDO activity was also detected in four of five DC cultures activated with IFN-γ alone (mean kynurenine, 22.2 μM), and kynurenine levels were highest in DC cultures activated with a combination of CD40L, LPS, and IFN-γ (kynurenine detected in five of five cultures; mean, 34.8 μM) or CD40L and IFN-γ (kynurenine detected in four of four cultures; mean, 40.5 μM). (Fig. 2⇓). 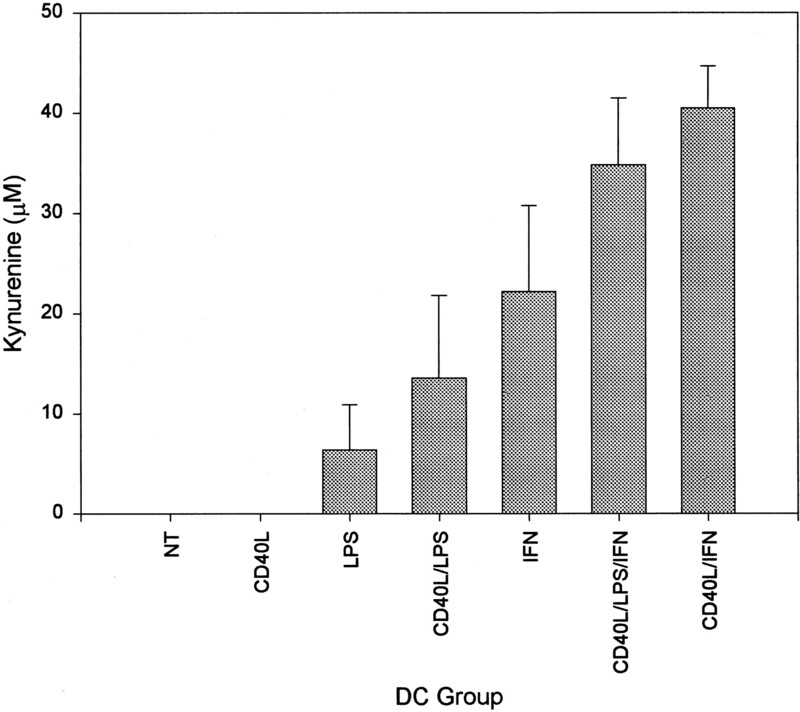 To eliminate the possible role of contaminating cells in the DC culture, monocytes were purified using negative selection and cultured in GM-CSF and IL-4. This resulted in DC cultures that were >99% negative for CD3, CD19, and CD14 (Fig. 3⇓). In repeated studies, stimulation of these cells with CD40L/LPS/IFN-γ or CD40L/IFN-γ in the presence of tryptophan resulted in high levels of kynurenine (Table I⇓). Thus, activated DCs expressed IDO which was capable of catabolizing tryptophan to kynurenine. IDO activity was greatest in DC cultures activated with a combination of CD40L, LPS, and IFN-γ or CD40L and IFN-γ. Functional activity of IDO produced by activated DCs. Cultured monocyte-derived DCs were grown in 96-well plates and activated on day 6 with CD40L, LPS, IFN-γ, or combinations of these. Twenty-four hours later, DCs were washed and resuspended in HBSS containing 100 μM tryptophan. After DCs were incubated for an additional 4 h at 37°C, supernatant was harvested and analyzed for kynurenine by HPLC. The presence of kynurenine reflects functional IDO activity, since kynurenine is produced upon catabolism of tryptophan by IDO. Highest kynurenine levels were seen from DCs activated with combinations that included CD40L and IFN-γ. Results shown are averages (and SEM) of DC cultures from five different donors (n = 5 for all groups except CD40L/IFN, where n = 4). Phenotype analysis of purified dendritic cell cultures. Monocytes were isolated from PBMC using negative selection and then cultured for 6 days in GM-CSF and IL-4. This resulted in DC cultures that were relatively devoid of contaminating T cells, monocytes, and B cells. Top row, FACS analysis using FITC- and PE-conjugated isotype-matched control Abs. 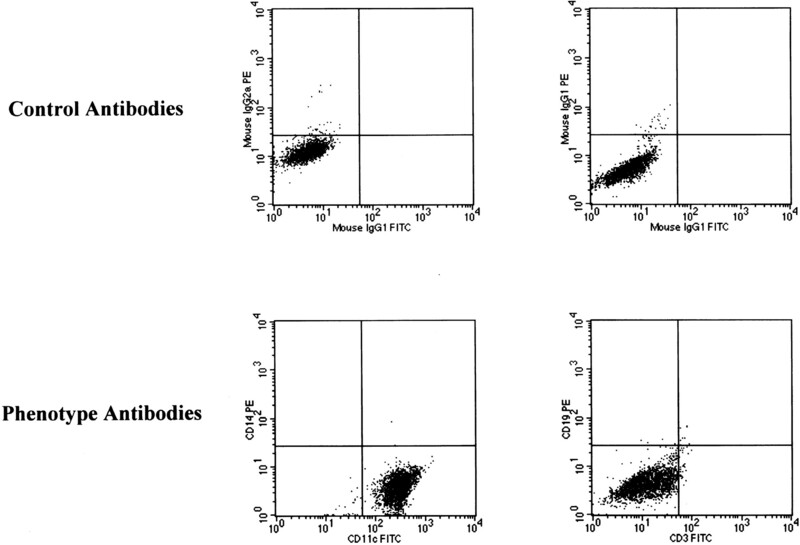 Bottom row, FACS analysis using FITC- and PE-conjugated Abs specific for CD11c, CD14, CD3, and CD19. Purified DC culture is positive for CD11c and negative for CD14, CD3, and CD19. During the course of an immune response, DCs may be exposed to both CD40L and IFN-γ upon contact with activated T cells. To determine whether activated T cells were capable of eliciting IDO production from DCs, we cocultured nonactivated DC with resting autologous T cells in the presence of soluble anti-CD3 (OKT3). An IFN-γ-neutralizing Ab was added to some of the groups to determine whether IDO production was IFN-γ dependent. Two days after coculture, T cells were removed by positive selection, and the remaining cells were cultured in the presence of HBSS containing 100 μM tryptophan. As before, nonactivated DCs demonstrated no IDO activity. Significant IDO activity was seen in DCs that were exposed to OKT3-activated T cells. IDO activity appeared to be IFN-γ dependent, since kynurenine levels were significantly lower in DCs and T cells that were cocultured in the presence of an IFN-γ-neutralizing Ab. This experiment was repeated with similar results (Table II⇓). Next, we determined whether IDO production by DCs resulted in the inhibition of T cell proliferation through the catabolism of tryptophan, as earlier reported for IDO production by macrophage cultures. Macrophage-induced T cell inhibition was prevented with the IDO inhibitor 1-MT (6). DCs activated with CD40L, LPS, and IFN-γ were cocultured with autologous T cells and OKT3 in the presence or absence of a variety of concentrations of 1-MT. In repeated studies, the presence of increasing concentrations of 1-MT resulted in enhanced T cell proliferation (Fig. 4⇓). 1-MT had no effect on the proliferation of T cells or DC cultures alone, and thus was not acting as a direct growth factor. These results suggest that IDO production by activated DCs is capable of inhibiting T cell proliferation. Inhibition of IDO activity by 1-MT results in enhanced T cell proliferation. Cultured monocyte-derived DCs were grown in 96-well plates and activated on day 6 of culture with a combination of CD40L, LPS, and IFN-γ. Twenty-four hours later, medium was replaced and 2 × 105 purified autologous T cells were added per well along with anti-CD3 in the presence and absence of a variety of concentrations of the IDO inhibitor 1-MT. 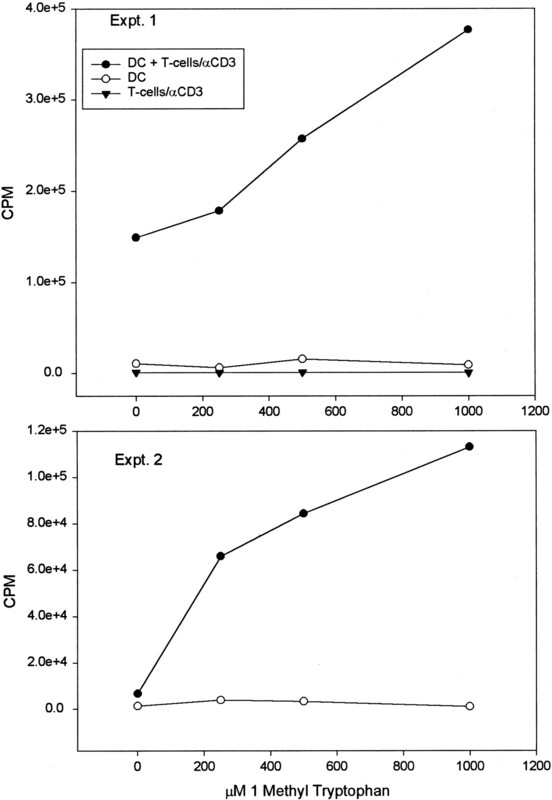 Four to 5 days later, T cell proliferation was measured using [3H]thymidine incorporation (1 μCi/well). In repeated experiments, the addition of 1-MT resulted in enhanced T cell proliferation in a dose-dependent fashion. 1-MT was not acting as a growth factor since it did not induce proliferation when added to DC or T cell cultures alone. Because DCs are the most potent activators of naive T cells, it is somewhat of a paradox that DCs can produce an enzyme that may result in inhibition of T cell proliferation. Several potential hypotheses may explain this phenomenon. IDO production by activated DCs could contribute to a mechanism to self-limit immune responses. This may be part of a negative feedback loop whereby DCs may regulate immune responses in the presence of a large number of activating T cells expressing CD40L and IFN-γ. An alternative explanation is that IDO may be produced by a subset of inhibitory DCs within the bulk population, since evidence exists for the presence of inhibitory or tolerogenic DCs (1, 11). The studies we have described have utilized bulk monocyte-derived DCs. Further analysis of this possibility will require additional knowledge concerning the phenotypic markers for tolerogenic DC subsets. A contrasting explanation may be that IDO production by activated DCs may result in a transient inhibition of proliferation that may protect T cells against activation-induced cell death. Since activation-induced cell death occurs upon activation of proliferating T cells (12), transient tryptophan depletion may inhibit T cell proliferation at the height of activation, thereby preventing T cell death. Tryptophan depletion has been demonstrated to inhibit T cell proliferation at a mid-G1 arrest point, but this was reversible with addition of tryptophan along with T cell stimulation (6). Activated DCs have been shown to be present in the lymph node early in the immune response, but fail to be detected 48 h later (13). This may allow tryptophan levels to return to normal in the T cell microenvironment shortly after activation, thereby providing a milieu that is once again permissive for T cell proliferation. Attempts are currently underway to utilize activated DCs for viral and tumor immunotherapy. If IDO production by DCs is indeed inhibitory for cellular immune responses, it is possible that systemic inhibition of IDO may enhance the T cell-activating ability of DCs. Munn et al. (5) demonstrated that systemic administration of 1-MT resulted in enhanced T cell responses against allogeneic concepti. Further work is needed to determine whether 1-MT can improve the antitumor efficacy of infused DCs. In addition, although it has been demonstrated that IDO production by macrophages, syncytiotrophoblasts, and now DCs can inhibit T cells, it is not clear whether other tissues can be induced to produce IDO capable of depleting local concentrations of tryptophan and inhibiting cellular immune responses. For example, it is possible that tumor cells may evade immune recognition if they can be induced to produce functional IDO. Consistent with this hypothesis, we have observed that tumor cells can produce IDO mRNA upon stimulation with IFN-γ (Fig. 5⇓). Further studies are needed to determine the range of cells capable of inhibiting T cells through tryptophan depletion. Northern blot analysis of RNA from cancer cell lines for IDO mRNA. 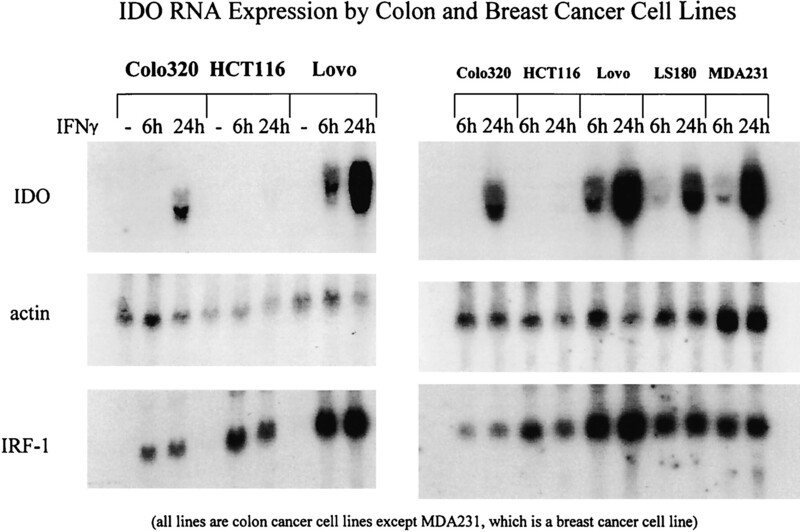 Colon cancer (Colo 320, HCT116, Lovo, and LS180) and breast cancer (MDA 231) cell lines were cultured in the presence and absence of IFN-γ. Six and 24 h later, total RNA was isolated and Northern blot analysis was performed using an IDO cDNA probe. β-actin and IFN response factor-1 cDNAs were used to control RNA loading and responsiveness to IFN-γ, respectively. ↵2 Abbreviations used in this paper: DC, dendritic cell; IDO, indoleamine 2,3-dioxygenase; CD40L, CD40 ligand; 1-MT, 1-methyl tryptophan.